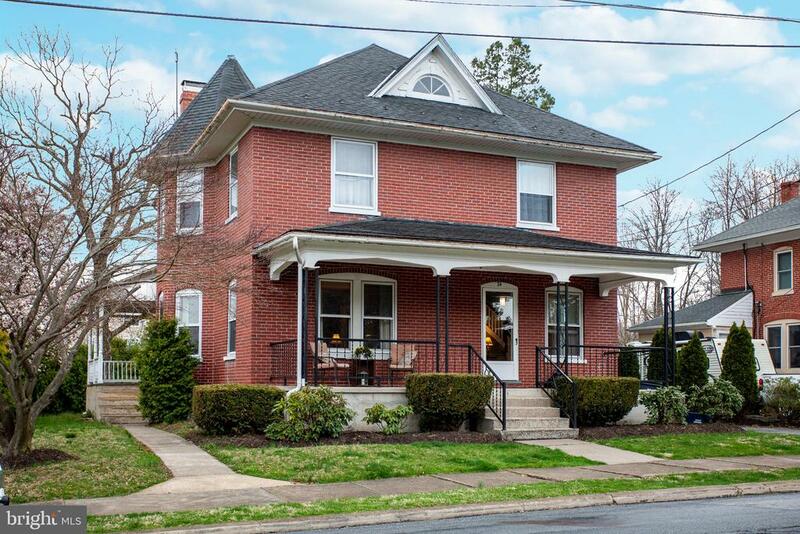 All Elverson - PA homes currently listed for sale in Elverson - PA as of 04/26/2019 are shown below. You can change the search criteria at any time by pressing the 'Change Search' button below. If you have any questions or you would like more information about any Elverson - PA homes for sale or other Elverson - PA real estate, please contact us and one of our knowledgeable Elverson - PA REALTORS® would be pleased to assist you. 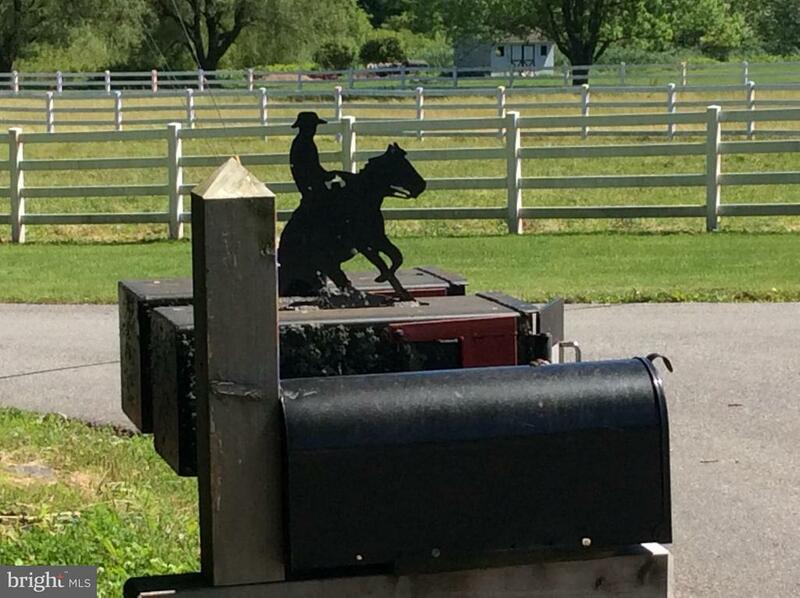 "This prestigious 24 acre horse farm is home to Matt Palmer, who is a World Champion Quarter horse trainer. Matt has established his Quarter Horse Reining business on this picturesque farm with a 22 horse stable, indoor riding hall and a lovely farmhouse styled home, built in 1989. Every aspect of horse and rider comfort, safety and care has been considered by the Palmer Family as they created this equine facility. The modest home overlooks 340'x160' outside riding ring area with lovely 4 rail white fencing. The tree lined driveway welcomes you into this stylish pastured area where horses can enjoy outside turnout in 4 large pastures." "Welcome to Olde Bulltown Village's 'Crocket House'. 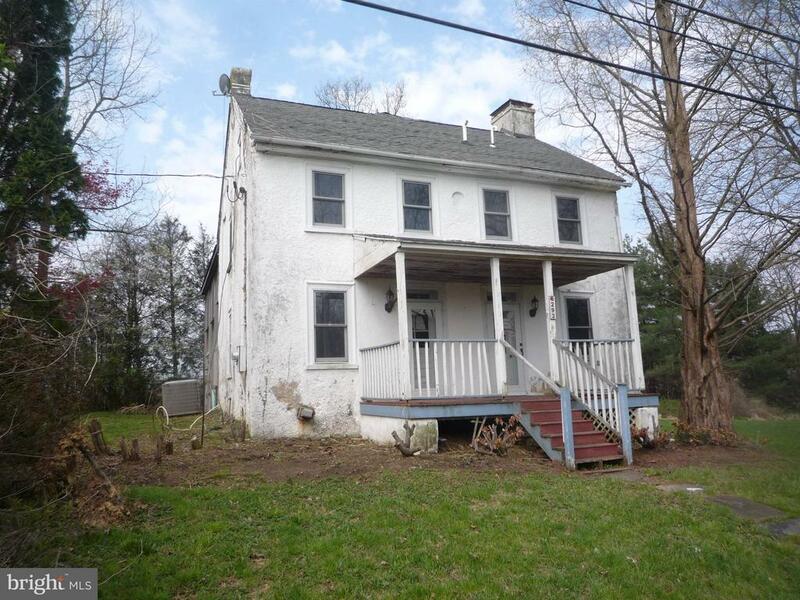 This simple cottage has the appearance of an early Chester County settler's home. The exterior is crisp white clapboard siding combined with handmade brick and a taper-sawn cedar shingle roof. The friendly picket fence leads up the brick pathway to the informal front entrance. Inside is random width, quarter-sawn oak flooring and white-washed vaulted ceilings with exposed pegged rafters. The kitchen has custom cabinets with soapstone countertops. The island is capped with a reclaimed barn beam. Separating the dining area from the living room is a double-sided fireplace. The master bedroom is conveniently located on the first floor with a walk-in closet and lovely tiled full bath. Upstairs is a special guest bedroom and bath with and a loft overlooking the great room. There is plenty of room to enjoy in the lower level family room with farm styled fireplace. Don't forget the covered back porch with built-in grill over looking French Creek Golf Club." 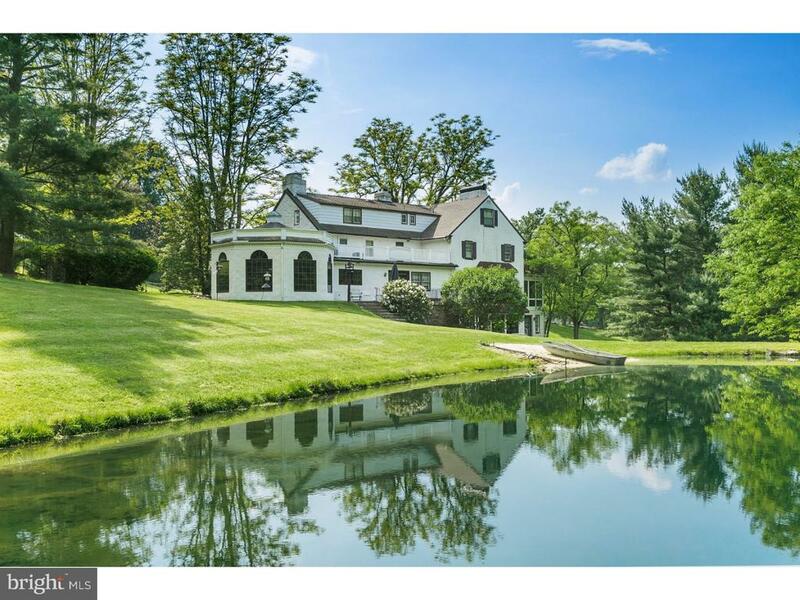 "Unparalleled views, impeccable landscaping, and pure serenity awaits you at 141 Hopewell Rd. 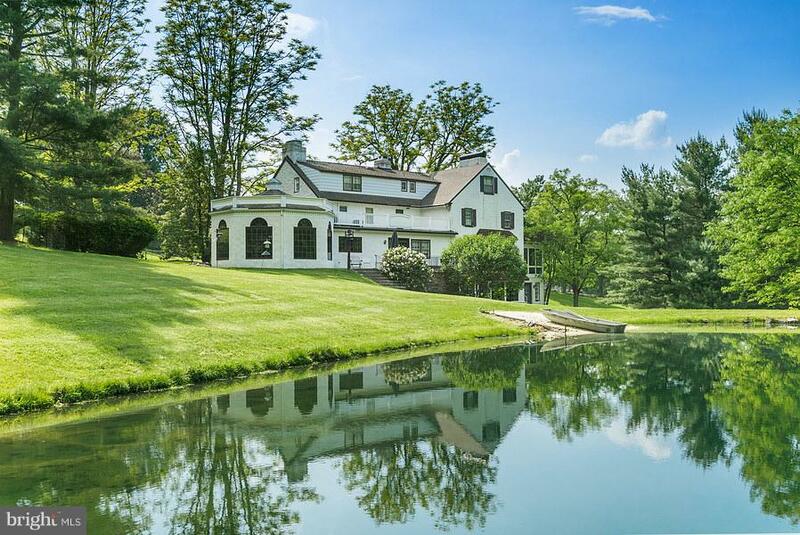 A meandering drive carries you past a spring-fed heart-shaped pond to an incredible 23.5 acre estate with a 5000+ sq ft home (dating back to the 1850's), bank barn, spring house and detached garage that backs up to French Creek State Park and Game Lands totaling over 7000 Acres. This incredible stone, log and Dutch lap home was fully rehabbed with all the finishes one should expect in a quintessential Chester County farmhouse wide pine and handmade tile floors, antique wood beams, hand hewn log mantels and exposed stone walls while also having an impressive layout conducive to the modern buyer. A flagstone walkway leads to a central solarium entry with a wall of French doors and Banta ceramic tile flooring that opens to a family room with stone fireplace and spiral staircase to a 2nd floor loft. The tile flows into a lovely log cabin style kitchen addition with breakfast nook and access to the 900+sq ft stone patio and functioning spring house with arguably the most delicious water in the county! The kitchen is open to a spectacular dining area with remarkable walk-in fireplace and vaulted ceilings. Flanking the solarium on the left is a dramatic 18' two story living room with floor to ceiling stone fireplace and enormous Palladian window that floods the room with natural light and offers incredible pond views! Finishing out the first floor is an oversized office with custom bookcase, mechanical room and powder room with pedestal sink. An open wood staircase from the living room leads to the master bedroom suite with large walk-in closet, and masker bath with access to a 2-tier deck with hot tub and expansive wooded hillside privacy. The master landing also provides access to a convenient laundry room, loft area and a large front facing deck. The 3rd floor has a princess suite with exposed stone wall and wood beams and a 17x10 multipurpose loft? and have we mentioned the vie"
"After morning coffee, at your property, enter the Horseshoe trail for a 3 mile ride though the 530 acre Warwick County Park. Upon your return take a dip in your crystal clear pond, surrounded by unmatched rural beauty. Most room sizes are unusually large allowing decorative opportunities as well as unmatched outside door & window vistas which are rarely found in older homes: LR 33x19, DR 22x13, Den 33x19, Breakfast Rm 21x21, Master Bed 21x19. 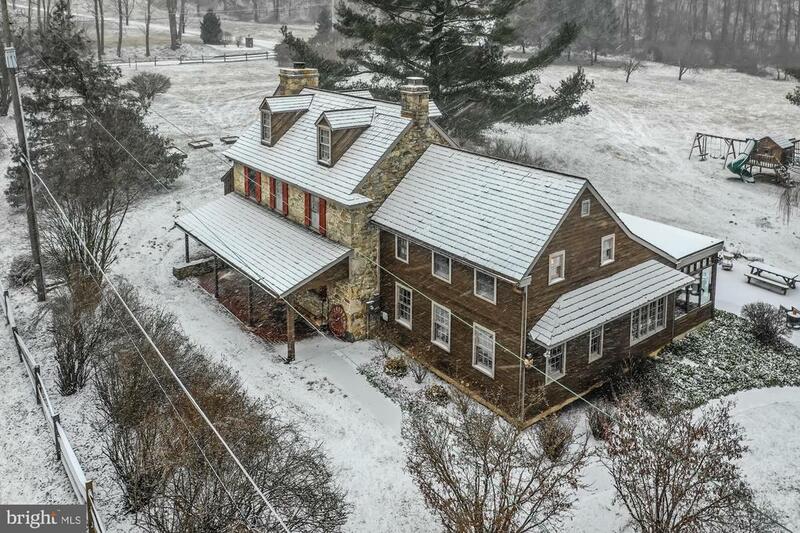 220 Hill Road is a historic stone farmhouse featuring 6 gracious bedrooms, 3 baths and 22 acres. The property features an abundance of amenities including a stone bank barn, large 3 bedroom apartment, workshop and 9 horse stalls. Panoramic views of open meadows, rolling hills and the spring fed pod are abundant. David Potts, whose Revolutionary War family founded Pottstown, sold the property to Chris Knauer of Knauertown in 1883. The Potts family co-owned & operated the nearby Warwick Furnace, a national landmark, during the 1700's & 1800's. The home features formal living spaces, a large kitchen adjoining the Monticello Room as it's been aptly named which features 5 floor to ceiling windows around the entire octagonal shaped room. Breathtaking views can be enjoyed from every vantage point! On the opposite side of the home is a wonderful screened in porch and terrace overlooking the the pond. Historic home enthusiasts will appreciate the detail and craftsmanship in this home, especially the original 18th century DR with it's beautiful millwork, walk-in stone FP and hefty beams. On the second floor you will find the large main bedroom with full bath and dressing area. There are two other bedrooms and a hall bath as well. up to the third floor you will find 3 more bedrooms and 2 full baths. The Basement is finished, with full bath, laundry room and has an outside exit, making it very convenient when you come in for a swim in the pond or to take your skates off in winter. Close to modern conveniences but tucked away from the hus"
"Welcome to the unique new construction community of Olde Bulltown Village where beautiful 18th century architecture is blended with 21st century luxury. 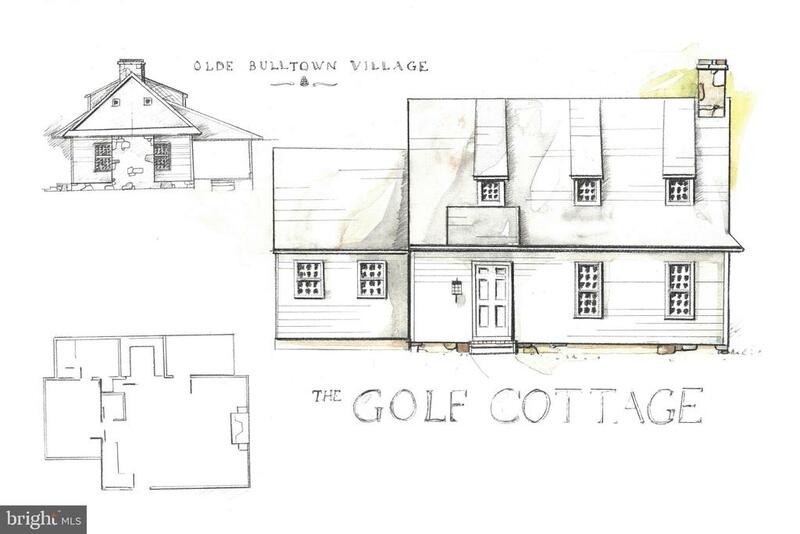 The Golf Cottage is a ready to build home in award winning custom home community of Olde Bulltown Village. Regional and National winner of Best Home and Custom Home of the Year. Located in Northern Chester County, surrounded by 1,500 acres of protected space including French Creek Golf Club and Stonewall Golf Club. Quality materials, careful craftsmanship and attention to traditional details add character and charm to this new old house. Interior photos are of existing homes in the community and represent the quality and craftsmanship. Geothermal heating and cooling reduces energy costs making this unique home both beautiful and efficient. Price of .66 acre wooded lot is include. HOA takes care of snow removal and lawn maintenance. Standard features include Chester County field stone, beaded shiplap siding, cedar shingle roof, copper gutters and downspouts, crown molding, brick patios and walkways, barnstone tread stairs, 2 car detached garage. Superior Wall foundation walls, 2x6 exterior wall framing. INTERIOR DETAILS: Flooring- brick tile, porcelain tile, pine floors, carpet, wainscoting, beadboard ceiling boards, wood show rafters, custom cabinetry and bathroom vanities, soapstone, granite, marble counters. Tile showers, build in shelving, custom master closet, high end appliances and fixtures. 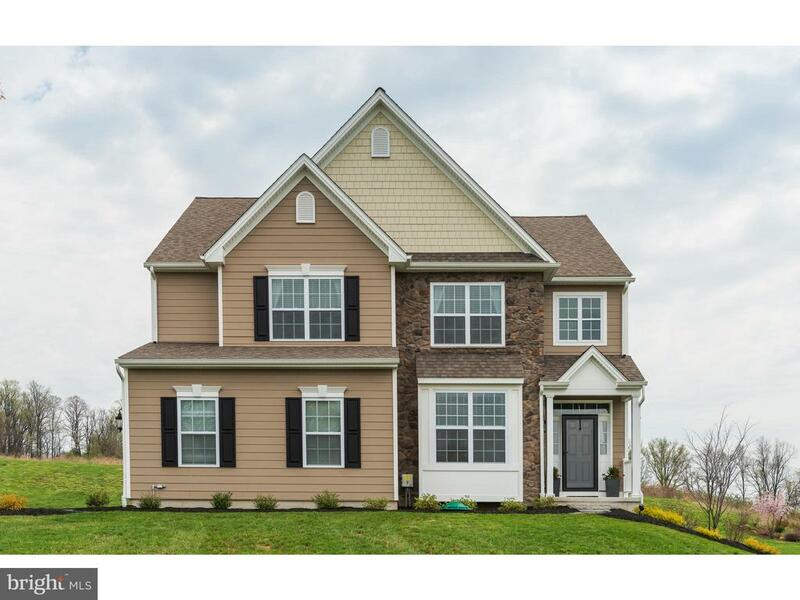 This one-of-a-kind community is located in Northern Chester County, 20 miles from West Chester; 4 miles from PA Turnpike; 5 miles to French Creek State Park. Visit our model home Fridays, Saturdays, Sundays 1-4PM or anytime by appointment. www.OldeBulltown.com"
"Welcome to Peaceful Living in the most gorgeous areas of Chester County, where equestrians delight in riding directly from the Barn on hundreds of acres of trails for beginners and more challenging rides. Close by and a perk from the pasture is the trail entrance to Warwick County Park and the Horseshoe Trail. This property is the Perfect Home and Horse Facility for the professional or ambitious amateur equestrian. This 11 ac farm features something for everyone, plenty of pasture and fencing, Large Lighted Outdoor Ring w spectacular sand footing and plenty of room for training. All fields have water and electric. Fabulous Young Barn has 5 Kentucky Style airy stalls, each has its own window in every stall for max air flow + convenient fan or heated bucket hookup and Barn incl 1 Very Lg Foaling Stall + Tack Room. This farm has features to Support All Equine Interests. What is more delightful is the ability to ride right from your property on many enjoyable and challenging trails. Also nearby is French Creek State Park with more trails, fishing, camping, boating, swimming and much more. See HopewellBigWoods dot com. Very long and private drive brings you to a newer 2 Story Custom Colonial by George Harlan Builder with all of the bells and whistles, including a Great Room Stone Fireplace, open and pristine style main floor with breakfast area and plenty of counters and new granite being installed, Secretary Desk and additional Butler Bar, Private Dining and Sliders to rear stone deck to enjoy your morning before joining our equestrian friends for a lovely ride. Master Bedroom with cathedral ceiling offers the whirlpool bathing and a private office/dressing room, and vistas galore. Ample trailer parking for both boarders and clients shipping in. This area of Northern Chester County has hundreds of acres in preservation and horseback riding is prominent. Many clubs, shows and hunts are conveniently nearby. While located in the beautiful countryside, we conveniently"
"This country Tudor home has it all. Move-In condition with over 4,000 sq ft of living area. Custom oak and yellow pine floors, baseboards and door molding throughout the home. Solid wood doors, ceramic door hardware, 2 custom made mantles and bookcases. Decorative wood beams in several rooms. Four bedrooms, 2 full baths and 2 half baths with hand made bathroom floor tiles. Hardwood floors throughout. Living Room with fireplace and a walk up library. Family room with a walk-in fireplace and beamed ceiling. Large kitchen with loads of cabinet space and breakfast room. Two heat pumps with oil back-up systems. Full finished basement with approximately 1,100 sq ft with large recreation/media room, offices and a utility room with sink, plus and powder room. 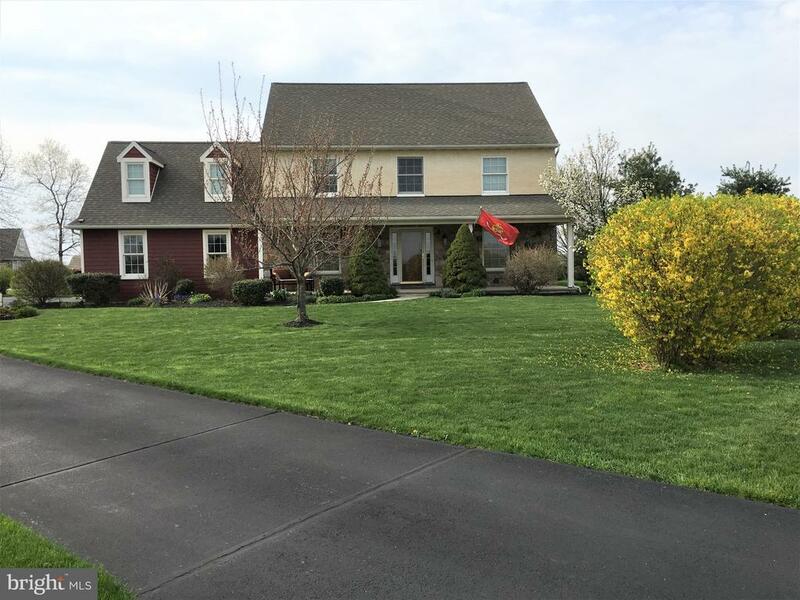 Located on 11.3 acres in West Nantmeal Township, there is an in-ground pool complete with pool house (powder room) and gazebo. There is a separate 20 x 40 barn on the property. This is a fantastic country property, but not far from access to major roads and shopping area. Roofs are all Cedar Shakes, 1st and 2nd floors are plastered walls. Natural Chester County stone on the front of the house and both chimneys Oil fired auxiliary backup heat and domestic hot water." "There is no stucco left on this house. Remediated with a Hardi product which appears like stucco for the complete tudor look. Best Value on the market. First time offered by original owners who hand-selected this premier lot in bucolic Warwick Township, prime horse country-opportunity presents itself for the next fortunate buyer. Backing onto a preserved buffer, this property is a stunning, level lot, offering unparalleled privacy! Enjoy entertaining al fresco on expansive terrace with recessed lighting in beautiful walls and stairs overlooking spectacular grounds with matured landscaping. Low-maintenance exterior features stone finishes. Interior highlights include Pella casement windows with transoms, custom millwork, site-finished white oak hardwood flooring throughout first floor, elegant turned staircase with dramatic foyer. Formal living room with two sets of French doors and family room both feature beautiful fireplaces and many windows. The large dining room is not only elegant, but friendly and the size accommodates large family functions or intimate dinner parties. The formal powder room has a lovely niche. The custom kitchen features a furniture island, cooktop with vented hood, pot filler plus a built-in hutch all with granite and tiled backsplash. The back foyer and huge laundry room with potting sink and many cabinets completes this remarkable first floor. Second floor is equally exquisite with master suite featuring a large sitting area, accented with many windows, spa-like bath with separate dressing area charming built in dresser and niche shelving, double-sink vanity, stand-alone spa tub and seamless-glass shower. Three additional very generously proportioned bedrooms are serviced by hall bath with two sinks. The third floor offers more opportunity for expansion. Wonderful dry lower level is unfinished but waiting for your choice of recreational living spaces and can be used for any number of purposes. 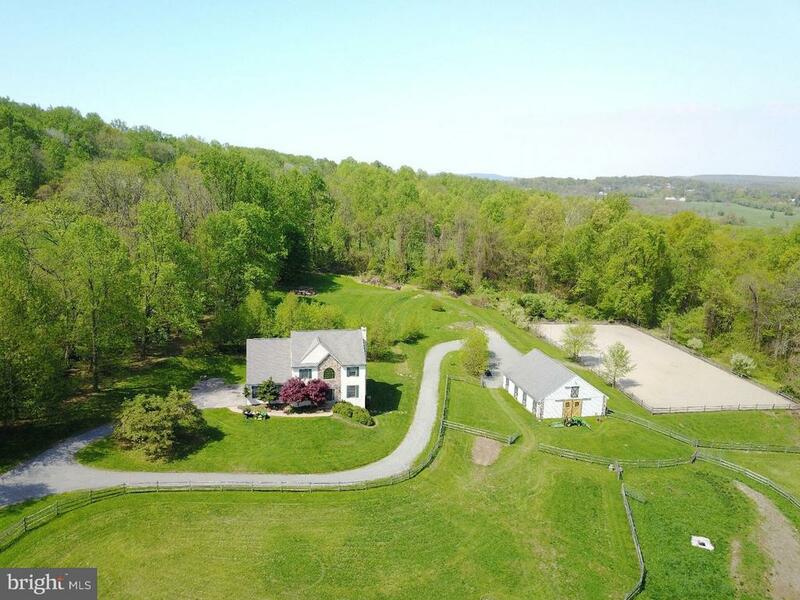 This home is limitless in terms of expans"
"Welcome to Peaceful Living in the most gorgeous areas of Chester County, where equestrians delight in riding directly from the Barn on hundreds of acres of trails for beginners and more challenging rides. Close by and a perk from the pasture is the trail entrance to Warwick County Park and the Horseshoe Trail. This property is the Perfect Home and Horse Facility for the professional or ambitious amateur equestrian. This 8.1 ac farm features something for everyone, plenty of pasture and fencing, Large Lighted Outdoor Ring w spectacular sand footing and plenty of room for training. All fields have water and electric. Fabulous Young Barn has 5 Kentucky Style airy stalls, each has its own window in every stall for max air flow + convenient fan or heated bucket hookup and Barn incl 1 Very Lg Foaling Stall + Tack Room. This farm has features to Support All Equine Interests. What is more delightful is the ability to ride right from your property on many enjoyable and challenging trails. Also nearby is French Creek State Park with more trails, fishing, camping, boating, swimming and much more. See HopewellBigWoods dot com. Very long and private drive brings you to a newer 2 Story Custom Colonial by George Harlan Builder with all of the bells and whistles, including a Great Room Stone Fireplace, open and pristine style main floor with breakfast area and plenty of counters and new granite being installed, Secretary Desk and additional Butler Bar, Private Dining and Sliders to rear stone deck to enjoy your morning before joining our equestrian friends for a lovely ride. Master Bedroom with cathedral ceiling offers the whirlpool bathing and a private office/dressing room, and vistas galore. Ample trailer parking for both boarders and clients shipping in. An offer you can't refuse. This area of Northern Chester County has hundreds of acres in preservation and horseback riding is prominent. Many clubs, shows and hunts are conveniently nearby. While located in the beautiful countr"
"For more than 25 years, family-owned and operated Rotell(e) Development Company has been Pennsylvania's premier home builder and environmentally responsible land developer. Headquartered in South Coventry, we pride ourselves in our workmanship and stand behind every detail of each home we build. HOUSE IS TO BE BUILT. Come to our Studio to take a look at all of the various house plans we have available. We offer homes with packages that include stainless steel appliances, granite countertops, and oak treads with painted pine risers. We also offer a variety of options to make your home the dream you imagine! Call today and speak to one of our Home Experts at Studio (e)! *Please Note: Pictures show options not included in the listed sales price or as a standard. Listing reflects price of the Augusta in the (e) + series." "This circa 1700's home is in the National Heritage Protection District. 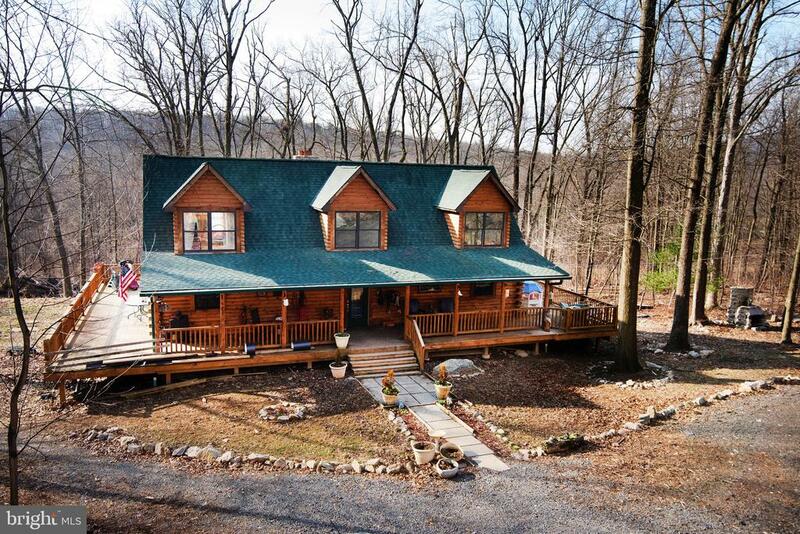 Situated on 3.2 acres it offers additions and renovations with updated amenities. The spacious living room with walk-in fireplace has a new woodstove insert, random width flooring, exposed beams & built-in bookcases. The formal dining room with it's random oak flooring provides seating for the largest family gatherings and an abundance of natural light. The large updated kitchen offers oak cabinetry, double ovens, new ceramic cooktop & tile countertops. The charming sunroom offers a serene viewing for the patio, grounds and pond. The first floor laundry room with utility tub provides access to the rear yard. The oversized master bedroom with exposed beams & ceiling fan has an attached master bath. The second bedroom also has a ceiling fan. The third bedroom provides that perfect get away for views from the window seats & provides built-in closets & cabinets. The brick patio is the perfect spot for summertime entertaining. The close by garden shed has been converted into an office, she shed or the perfect guest quarters with it's own covered porch/fans. The french door leads to a covered patio/porch. It is heated & cooled by a split unit. The large barn can be used for storage. The spring fed pond is stocked. The chicken coop is ready for a new family! The 3 car detached carport can be used for cars, farm equipment, etc." "Are you looking for that unique one of a kind home on a private location? Look no further, escape to this private retreat on 8.6 acres! Custom built log home is three years young! Three bedroom, 2.5 bath with wood floors and log walls. Large great room that allows you to enjoy the views from the double french doors leading to the wrap around deck while relaxing by the stone floor to ceiling wood burning fireplace. First floor master bedroom boasts a walk-in closet and tiled master bath. Two additional bedrooms on the second floor with full bath and cat walk overlooking great room. Beautiful kitchen with granite tops and island, large dining area with french door to deck. Lower level is walk-out and ready for finishing. Three car detached log garage compliments the home nicely. Apartment or in-law suite above garage is partially finished. The property borders a creek which butts up to state game lands. Home in minutes from French Creek State Park where you can take advantage of the two lakes, boat rentals and public pool. A must see home!" "Welcome to 225 Ironstone Ln. surrounded by the beautiful French Creek Golf Course and perched on the 6th hole of French Creek Village in northwestern Chester County, this spacious better than new 2 story colonial with beautiful views and abundant natural light. Enter from the front porch into the foyer and be greeted by gleaming hardwood floors that continue throughout the entire first floor. This is the perfect house for entertaining, with a large vaulted family room with gas fireplace open to the gorgeous kitchen and breakfast room complete with windows and views from all rooms. The gourmet kitchen will be the home chefs dream, gas cooking, stainless steel appliances, beautiful counter tops, cabinetry and tile backsplash. A private study is accessed through the front 2 story foyer, perfect for an in-home office. Follow the staircase to the 2nd floor, you will be greeted by the generously sized master suite with a tray ceiling and a sitting area. The master bath features a soaking tub, dual vanities, and a separate tiled shower. 3 additional nice sized bedrooms and a full hall bath complete the 2nd floor. The unfinished basement is ready to be whatever your heart desires, media room, home gym or game room the possibilities are endless (also has a rough in for a FULL bath!). Additional features include 9' ceilings throughout the first floor, hardwood throughout the foyer, powder room, kitchen, breakfast and morning rooms and granite counters in the kitchen. French Creek Village is nicely situated within 25 acres of the French Creek Golf Course which allows panoramic views of gorgeously manicured rolling hills and valleys. Convenient to routes 23, 401, 82, 100 and the PA Turnpike and only minutes from Ludwig's Corner, Henrietta Hankin Library, French/Marsh Creek State Parks, the Elverson Fitness Club and St Joe's Urgent Care in Elverson. A few miles west will find you in beautiful Lancaster County." "This Belmont Farmhouse is in a serene and wooded hillside setting in the Owen J Roberts school district, minutes from French Creek and is ready to be built with your customization. Grand 2-story foyer with crown molding that extends down entire 2nd floor hall, large LR, great DR with chair rail and crown molding. Spacious kitchen with 42cabinets, breakfast area with sliders, open to FR w/FP, plenty of windows to bring in the outdoors,laundry, mudroom with pantry and garage access, master bedroom with cathedral ceiling, walk-in closets, double closet, spa-like master bath with 12x12 tiles and double sink vanity, corner tub, stall shower, 3 good size bedrooms and hall bath with 12x12 tiles and double sink. Full basement . Too many amenities to mention H/W , Granite in Kitchen, Stainless Appliances just to mention a few. HOME TO BE BUILT!" "Lovely 3 Bedroom, 2.1 Bath Stone Farmhouse set on just under 7 acres in Elverson. The original home was built in the 1700s and from there two additions have been added to give the home its modern footprint. Materials from the property were utilized in renovations to include walnut flooring, a cherry staircase and cherry paneling. The home features a bright Kitchen with tile back-splash, a built in pantry and plenty of room for a table. The adjacent Living Room includes a number of lovely early features such as exposed stone, an open-beamed ceiling, wood floors and a stone Fireplace. The front Dining Room also enjoys a large stone Fireplace, wood floors, deep window sills and exposed stone. In addition, on the Main Level there is a Bedroom with full attached Bath and a private entrance. Upstairs is the Master Bedroom with exposed stone, built in drawers and cabinets and carpeting. There is an additional Bedroom upstairs as well as a Full Bath and Seating Area. Aside from this beautiful home the property also enjoys a gorgeous yard with lush, mature landscaping, a flagstone patio with pergola, walking trails and a pond in addition to a 9 bay Pole Barn and two Cabins. Come experience all this lovely property has to offer today." "Welcome to this impressive Stoltzfus-built home in the quaint town of Elverson. This home has it all! From the welcoming front porch overlooking the countryside to the serene location of the Sunroom overlooking the rear yard, it is a pleasure to call this HOME! As you enter through the 2-story foyer, the hardwood floors flow from the entry continuing through kitchen and dining area. Loads of recessed lighting and fresh paint throughout! The formal living room has a custom built-in wall unit and opens to the dining area via pocket doors. The spacious eat-in kitchen includes updated SS appliances, ample cherry cabinetry and counters, spacious pantry leading to the laundry room with direct access to the garage. The kitchen area is open to the step-down familyroom with a wood-burning fireplace, cathedral ceiling and doors leading to the Sunroom. Finishing out the 1st floor is a study conveniently located away from the main hub of the home. Upstairs you will find the generously sized master bedroom featuring a large walk-in closet and spacious 4-pc master bathroom. The centrally located hall bath conveniently serves the other upstairs bedrooms. The finished lower level offers many options for your use with a large game room, hobby room, work-out area and unfinished area for additional storage. This home was constructed with 2X6 exterior walls, Superior basement wall system and is heated and cooled with a Geothermal System ~ making it both comfortable and affordable. Another benefit to this fine home is that there is no HOA and low property taxes. This property is adjacent to Elverson~s Livingood Park, surrounded by open fields, playgrounds, and a pedestrian walkway. Minutes from shopping, convenient to the turnpike exchange and so much more. This is a spectacular find!" "2 Houses on 1 beautiful property. Great set-up to live in one and rent the other. The charming stone home in front features 2 bedrooms and a full bath. The cottage in the rear of the property is 2 bedrooms and 1 full bath." "This 1800's farmhouse dates back to the 1800's and offers an addition with the estimated sq ft at just under 3000. There are 4 bedrooms, 2 baths, a living room fireplace and a huge fireplace in the basement. The lot is just under 2 acres and has your own pond for enjoyment. Immediate possession." "Charming 3 bdrm, 2.1 bath townhome on a Cul-de-sac, in highly coveted Summerfield Neighborhood in Chester County. Open floor plan, Twin Valley SD, 1 car garage, hardwood throughout 1st & 2nd floors. Economical Geothermal heat, central air and hot water w/ propane stove in LR.Main floor features an elegant foyer, half bath, large coat closet, garage entrance, beautiful, oversized 31 handle, eat in kitchen, dining area with huge bow window and Plantation blinds opening to a large living room with French doors to the deck overlooking open fields. Upstairs you~ll find a spacious master suite, 2 other large bedroom w/great closets, laundry and full bath. Basement offers 2 bonus rooms in addition to the Family room and lg storage area. The home is built by Stoltzfus Builders. The HOA is $800 annually and covers lawn, snow removal and Common areas. NO Capitol contribution. 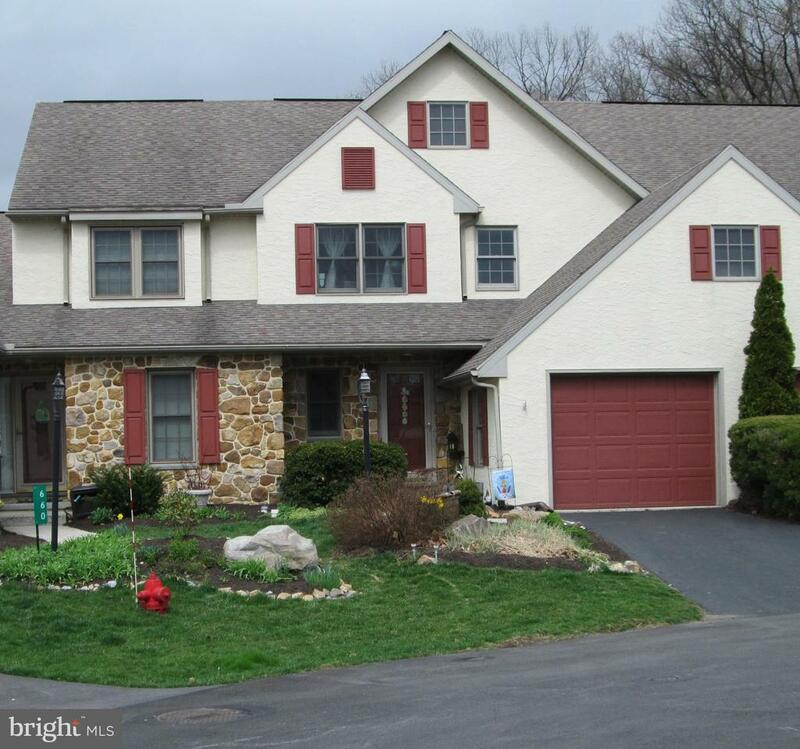 Located in the heart of Elverson in beautiful Chester County, minutes from the PA turnpike, Rtes 82,401,345 & 23. Schedule today, this one won't last." "Wow, please don't hesitate to see this lovely single family home is nicely placed on quiet end street!! Conveniently located within an easy commute to the PA Turnpike & Routes 23/401/82/100, French Creek State Park, St. Peters Village, and J Maki Winery. Twin Valley Schools are right down the street!" "One of the Lowest Priced Single Family Homes in the Elverson area by a long shot! 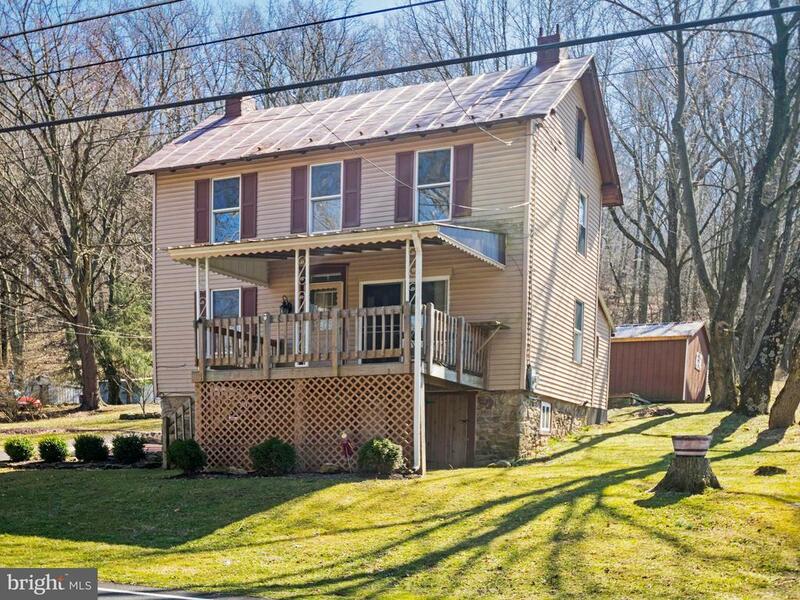 Bigger than it looks 4 bedroom 1 bath home in Chester County~s Elverson Borough and Twin Valley School District (Twin Valley Elementary). The exterior of this Cape Cod is covered in vinyl siding, giving it a modern look. The living room enjoys plenty of natural light through its front bay window, and features a wood stove set on a classic red brick surround. Moving towards the center of the home, the kitchen has plenty of cabinet and countertop space, stainless steel dishwasher and microwave, plus a double sink with gooseneck faucet. A convenient countertop seating area separates the kitchen from the dining room, while the dining room is covered with hardwood floors and is large enough for a full dining set. Down one step in the rear of the home is the family room, with its vaulted ceiling, corner gas fireplace and a sliding door which leads to the back yard and patio. Just off the family room is the largest bedroom in the home, making one floor living a possibility. A full bathroom with tub and a 2nd bedroom complete the main level. Upstairs, you~ll find two additional bedrooms, each with windows on three sides. Downstairs, the nearly 1000' square feet of unfinished basement will ensure you never run out of storage space again, plus there is a detached two-car garage which opens even more possibilities. 113 South Chestnut Street sits on nearly an acre of ground, making it one of the largest residential lots in the Borough. The roof is less than 10 years old, and the house is connected to public water and public sewer. No HOA fee and low taxes of just $4,283/annually make this extremely affordable. Convenient Elverson location, across the street from Livingood Park around the corner from the 7,526-acre French Creek State Park, home to two lakes and nearly 40 miles of hiking and equestrian trails. Come see why Elverson Borough has been called the Greatest Square Mile in Pennsylvania!" "You can't turn back time, but you can own a beautiful piece of local history! Nestled on a third of an acre on a quiet side street, this 103 year old, solid brick charmer is brimming with all of the character one would expect to find in an early 20th century home including original wood moldings and trim, hardwood floors, plus airy nine foot ceilings and huge windows throughout that let in an abundance of natural light. Enter from the wide covered front porch into a sunny & spacious foyer with over-sized windows and original narrow plank hardwoods that flow into the expansive living room with two sets of bay windows and a stone-surround fireplace with glass front wood stove insert. The large eat-in kitchen boasts solid wood cabinetry, plenty of counter space, and a bright dining area. A convenient main floor laundry room leads out to the wrap around back porch where you can sit and enjoy some well-earned relaxation while enjoying views of the peaceful back yard. An upgraded powder room with tile floor and wainscoting completes the first floor. Head upstairs on the solid wood staircase to find a large master bedroom with dual closets and a separate dressing/sitting room, plus two more ample bedrooms that share a full hall bath with a dual vanity, pretty wainscoting, and a tub/shower combo. The full walk-up attic offers plenty of easy storage, and the partially finished basement offers an office plus a large family room with a second stone fireplace and a separate mechanicals room with even more storage possibilities. For your outdoor toys, you have an over-sized one car garage with a workshop area and shed space. 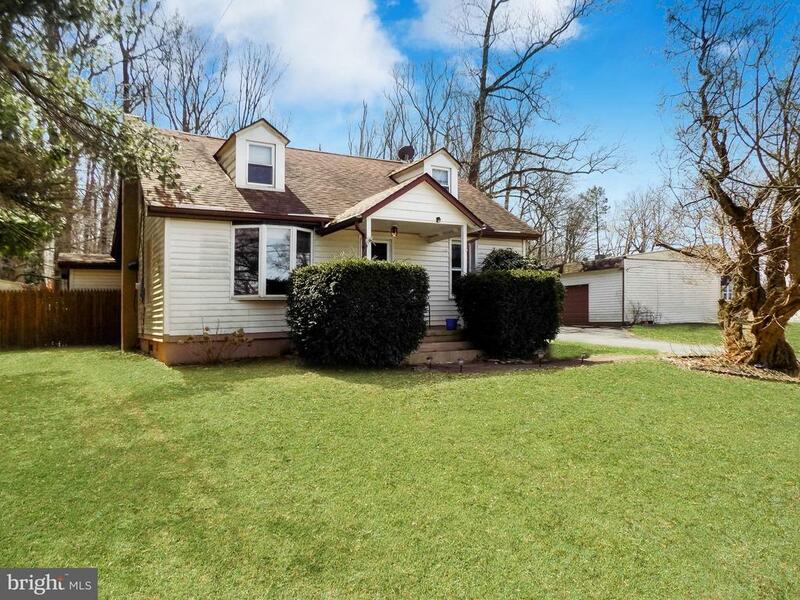 Conveniently located within minutes of the Turnpike, French Creek State Park, French Creek and Stonewall Golf Clubs, and Twin Valley Elementary, Middle and High School, this one won't last long, so schedule your appointment today!" 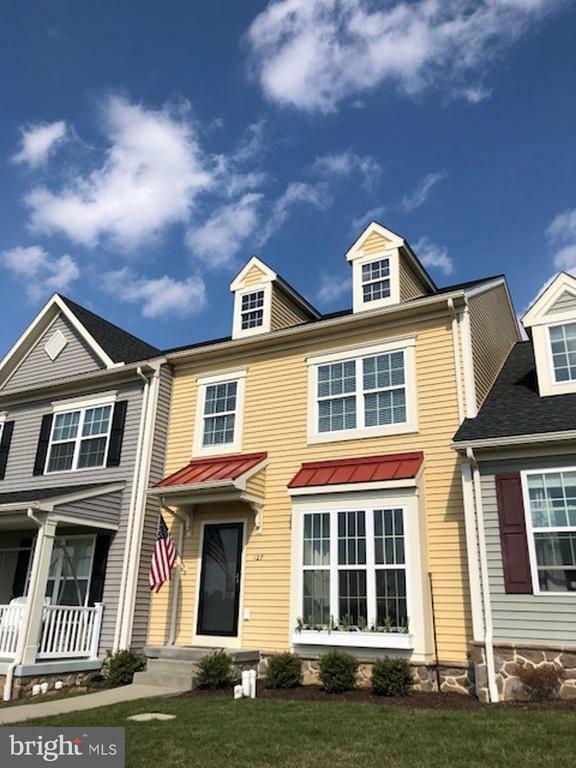 "Welcome to this well maintained townhouse in the beautiful Springfield Village development in Twin Valley School District! You will fall in love with this home as soon as you see the front yard view! Enter the front door and experience the open concept on the main floor. This bright and airy home boasts 9ft first floor ceilings. To the right there is a formal dining room or extra living room which has amazing farmland / sunset views! Kitchen separates the front living area and the open formal living room. All newer stainless steel appliances are included. Out back you will find a deck and a detached one car garage. The upstairs includes a laundry room, 3 spacious bedrooms and a full bathroom. Master bedroom has walk in closet,vaulted ceilings, attached master bathroom and linen closet. Basement is unfinished just waiting for the new owners touch! Follow the sidewalks to Elverson borough's beautiful Livingood Park, walking trails and more. Taxes were appealed and reduced to $3277 annually. Easy to Show!"